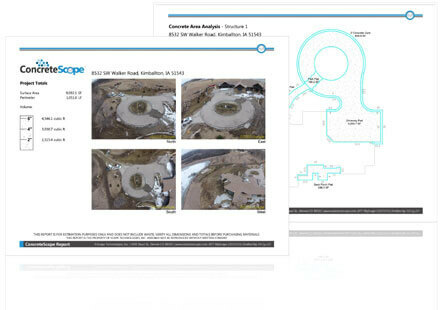 Scope Technologies streamlines the measuring and estimating process by delivering accurate, affordable, and timely takeoff reports for the contractor, architect, engineer, insurance adjustor, and more. Our measurement takeoff reports are generated using the latest in aerial satellite imagery and software, and we even provide reports using blueprints. Each report is drafted by a team of highly trained, experienced technicians, compiled into detailed yet condensed, environmentally-friendly reports. Think 2 pages, not 15. With unbeatable turnaround time and a 95% accuracy rate or better, you can show up at a job site with a professional report that sets you apart from your competition. Service and loyalty is our top priority, which is why we offer reward programs for our clients, as well as innovative tools and services like Text-to-Scope and ProDocs. Services like Text-to-Scope for easy ordering, updates & our ProDocs tool. Click on a product below to find out more. 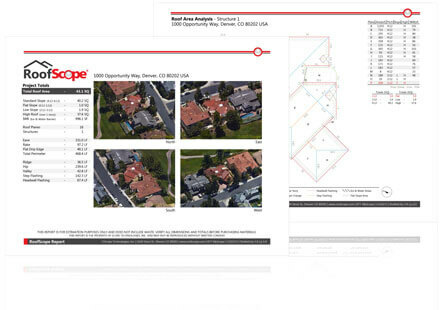 RoofScope reports compile all essential roofing measurements and images into an easy-to-read, environmentally friendly two-page report. 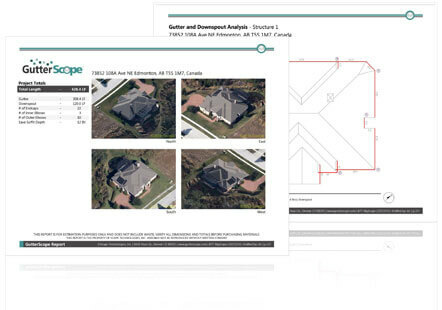 Individually developed by a team of highly-trained and experienced technicians, GutterScope reports compile all essential gutter measurements and images into an easy-to-read, environmentally friendly two-page report. Order paint materials quickly, with accuracy and confidence. Compiled by a team of our highly trained technicians, PaintScope reports include all essential measurements and images into an easy-to-read, environmentally friendly report. Tackle that siding job with a fast and accurate report. Compiled by a team of our highly trained technicians, SidingScope reports include all essential measurements and images into an easy-to-read, environmentally friendly report. 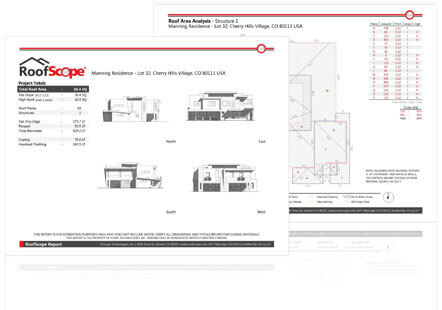 InsulationScope allows insulation installers to speed up the estimating and material ordering process. 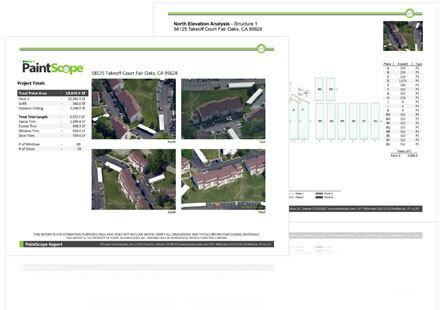 Easy-to-read InsulationScope reports include the square footage of an insulated space and aerial images, along with a plan-view aerial drawing of the entire structure that highlights insulated spaces. ConcreteScope provides accurate, affordable and timely aerial measurement reports for concrete or asphalt ground areas. Individually developed by a team of highly-trained and experienced technicians, ConcreteScope reports compile all essential measurements and images into an easy-to-read, environmentally friendly report. 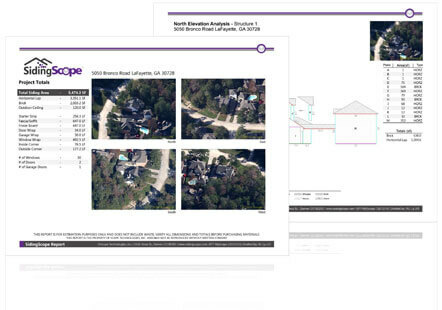 RoofScopeX is the “express” version of RoofScope, with fewer details but providing the data you need to act on a bid or claim. It allows contractors and adjusters to obtain fast, real-time measurements in order to provide a quick claim or estimate. 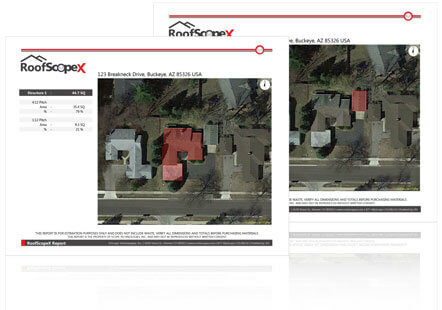 RoofScopeX reports are easy to order, affordable and are delivered within 48 hours of placing an order, often less. 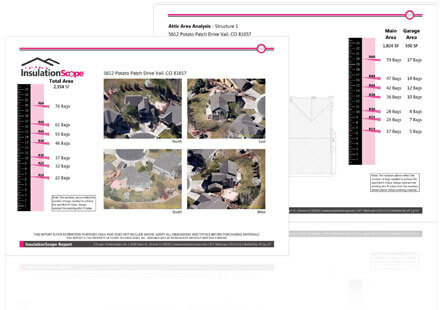 Designed to streamline new construction projects, BlueprintScope reports allow architects, engineers, and contractors to convert their blueprint files into measurement/material takeoff reports for roofing, siding, and gutters.